The hyperhydricity syndrome: waterlogging of plant tissues as a major cause. Ambitious expectations: somatic embryogenesis in ornamental plant propagation. Micropropagation in stationary liquid media. Photoautotrophic micropropgagation - environmental control for promoting photosynthesis. Applied physiology and practical bioreactor for plant propagation. Propagation of novel hybrid sweetgum phenotypes for ornamental use via somatic embryogenesis. Photoautotrophic growth of Dendrobium Burna White under different light and ventilation conditions. Micropropagation throuh somatic embryogenesis of Cyclamen persicum Mill. genotypes for cut flower production - feasibility study. Micropropagation of Alstroemeria in liquid medium using slow release of medium components. Seed cutting treatments stimulate germination and elucidate a dormancy gradient in dormant Fraxinus americana L. and Fraxinus pennsylvanica Marsh. The journal format is 21/29,7 cm. 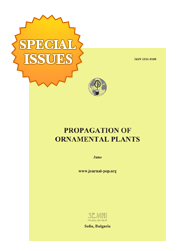 Propagation of Ornamental Plants is published 4 times per year. or 155 USD + 30 USD postal expenses (overseas).